Two Squares is a big supporter of Time Base Correction and we use it with all of our analog video transfer services. This is a critical step in ensuring your treasured video tapes are worth saving. There is nothing worse than expecting important memories to be saved, gathering the family, popping the popcorn and staring with anticipation – only to find them to be unrecognizable, jumbled and unsteady. Our local Minneapolis, MN media conversion services, that extend even out of the state, guarantee to leave you warmhearted with the familiar and more recognizable visual sights than ever before. We can offer this because we have the specific equipment needed and the skill to work it. Time Base Correction (TBC) was traditionally used to stabilize video signals to allow them to be mixed with other video signals in a studio. Lesser quality video sources such as tape based VTRs and VCRs need additional frame buffering to best guarantee signal timing and stability. As TBCs evolved, many added features such as “Drop Out Compensation” where lost or corrupted video lines or frames would be re-used from previous frames/lines to provide fill-in when the data could not be recovered from the signal. Though Drop Out Compensation is not a perfect restoration, it can eliminate some and sometimes much of the visual faults in a video stream. VHS tapes in particular use a separate track on the tape called a “Control Track” to hold synchronization pulses to mark the beginning of each frame of video. It also allows for the helical scan (spinning) video head to align itself to the diagonal tracks. This is why we had to adjust the “tracking” of our video tapes until later generations of VCRs gave us the “auto-tracking” feature. 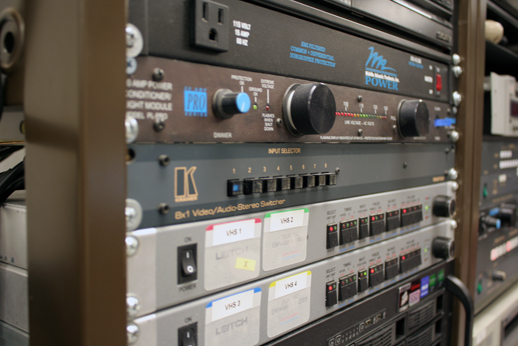 To the right is a picture of a set of video heads from a common VHS VCR. You will notice that the circular spinning head is tilted at an angle. From vintage film to studio tapes, we do it all.